The condenser consists of two adjustable capacitive plates, 100mm diameter and separated by a glass dielectric plate. Connection with hese plates is with 4mm socket terminals. 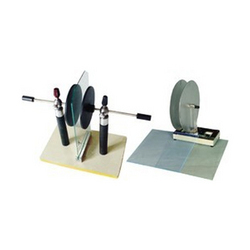 This glass plate is held in a clip betwen the discs and can be replaced by another material to show the effect of different dielectrics. 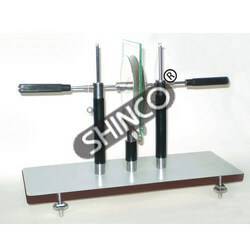 It consists of two adjustable plates 100mm. dia. insulated handle and a glass dielectric plate. Made from best quality of material, every equipment comes with the precision for which they are made for. These equipment find application in various educational institutions and research centers. As can be seen from the following we have a wide array of equipments in this category too. A pack of 6 leaves, size 25x6mm for Gold Leaf Electroscopes. comprises of two adjustable brass plates 100 mm dia with insulating handle and a glass dielectric plate on wooden base. Electrostatics-generator-epinus condenser-two brass 100mm discs on insulated pillars with pith ball pendulum a removable rectangular glass plate on insulated pillar is supported between the three pillars can be slided and clamped with the help of wing nut on the rod in any position. We are amongst the most reputed names in the industry, offering Aepinus Condenser.